"If they can't blend in, they could end up back in the pen." A full-length US trailer has debuted for Aardman Animations' Shaun the Sheep Movie, their latest stop-motion adventure following Wallace & Gromit and Flushed Away. This amusing stop-motion story follows a sheep named Shaun who decides to take the day off and have some fun, but gets a little more than he bargained for, ending up in the big city to find his family. As much as it may sound like something a bit cheesy, I trust in Aardman and from what I can tell this might be a lot of fun. The fluffy lil' handmade sheep are so cute! After the first two teasers, cue this up. When Shaun decides to take the day off and have some fun, he gets a little more action than he bargained for. A mix up with the Farmer, a caravan and a very steep hill lead them all to the Big City and it's up to Shaun and the flock to return everyone safely to the green grass of home. Shaun the Sheep is written and directed by Mark Burton (writer of Madagascar, Gnomeo & Juliet) and Richard Starzack, both making their directorial debut. 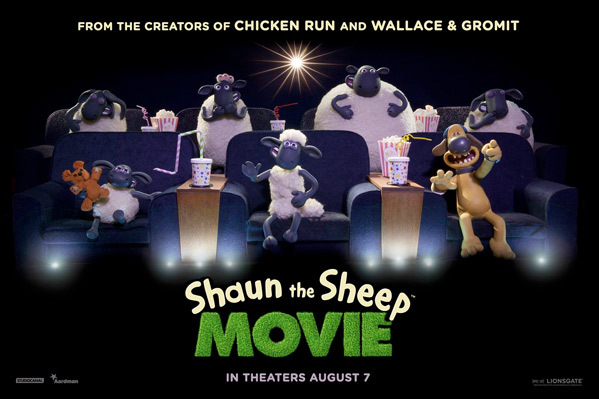 Lionsgate presents a Studiocanal and Aardman Animations production, and will release Shaun the Sheep Movie in theaters starting August 7th this summer. For more, visit the film's official site. It's Funny... Dobby liked it.. dobby smiled. Looks pretty great! I love this animation style. Miss Wallace & G!! Holy crap, I can't wait. I couldn't stop laughing from the cat.